A new beginning — again! Unfortunately, that’s how it usually turns out. Bad. With the rising popularity of self-publishing, the overall quality has fallen sharply. That’s not to imply that all self-pubbed books are in that category. I’ve read a good many of them that were really excellent. Plot, characters and writing were all fabulous. Generally, those authors went the extra step of having the manuscript proof-read by someone other than a spouse or best-friend. If you talk to the author of a book that is slip-shod, they’ll frequently say, “I know, but I couldn’t afford to have it edited or proofed. Maybe next time.” If they only knew – word of mouth is the best advertisement for any product, including books. Bad-mouthing (miserable snarky reviews included here) by disgruntled readers is a sure way to decrease sales, rather than increase them. Do you really want to risk your good name and future sales just to save a few dollars? You can’t afford NOT to put your very best effort out there for the world to judge. And judge, they will, believe me! It’s very true – the cost of editing and/or proof-reading varies widely. Some people (on both sides of that equation – buyer and seller) are of the mistaken impression that the more something costs, the better it is. That is not necessarily true. But a writer desperately needs to have someone who knows that not only is every word spelled right – but it’s also the RIGHT word! There are also different types of editors. Beware of the ‘slash-and-burn’ type, unless you want them to re-write your book for you. Without asking your permission to do so! Before committing yourself and your dollars, ask if you can get a sample edit on a few pages of your work. Ask the editor what type of edit to expect: a spelling and grammar-only correction edit should not cost as much as one that includes story flow and structure feedback, and/or point-of-view suggestions. It also helps to be sure the editor in question is knowledgeable about the genre of your book. For instance: I do not like excessive profanity or violence in the books I read, so I wouldn’t be a very good choice to edit or proof-read such a book. I don’t do horror, vampires, were-things or techno-anything. But I do read a good bit of romance, cozy mysteries and literary fiction, and have been known to read science fiction and non-fiction, including first-person narratives. Suppose you select an editor, and mid-book, the editor changes his/her mind about your project. Oops. What happens at that point? It’s well worth asking during the negotiations for the project. It’s best to part friends, if at all possible. An adjustment of the fee is certainly advisable, but it should be fair to both parties. Perhaps the content went astray after the initial agreement, or maybe the editor encountered some sort of personal emergency which would delay completion of the project. Along with my opinion, I’ll include an estimate of my total fee. Half of this amount is due when the project is assigned to me, and I accept it. At this time, I’ll give you an estimate of the time required for me to do a good job for you. (Most likely less than a month.) The remainder is to be paid upon completion of the project. I prefer to be paid by check or money order, although I may eventually work out something with my bank. 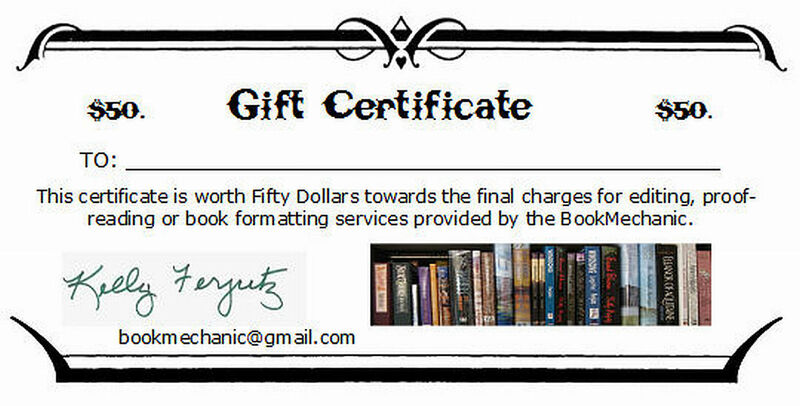 Once I’ve received payment, I’ll send along your completed manuscript. ← Fact or fiction. Does anybody care? Reblogged this on Dirty Little Bookers.